Production: Instituto Cubana del Arte e Industria Cinematograficos (ICAIC); black and white, 35mm; running time: 160 minutes. Released 1968. Filmed 1967 in Cuba. Producer: Raúl Canosa; screenplay: Humberto Solás, Julio García Espinosa and Nelson Rodríguez; photography: Jorge Herrera; editor: Nelson Rodríguez; sound engineers: Ricardo Istueta and Carlos Fernández; music: Leo Brower; costume designer: María Elena Molinet. Cast: Raquel Revuelta ( Lucia, Part 1 ); Eslinda Núñez ( Lucia, Part 2 ); Adela Legrá ( Lucia, Part 3 ); Adolfo Llauradó ( Tomás ). Award: Moscow Film Festival, Gold Medal, 1969. Solás, Humberto, Julio García Espinosa, and Nelson Rodríguez, " Lucia (Part III)," in Memories of Underdevelopment: The Revolutionary Films of Cuba , edited by Michael Myerson, New York, 1973. Burton, Julianne, editor, Cinema and Social Change in Latin America: Conversations with Filmmakers , Austin, 1986. Geoffrey Minish, and M. E. Douglas, in Take One (Montreal), July-August 1969. Engel, Andi, "Solidarity and Violence," in Sight and Sound (London), Autumn 1969. Interview with Humberto Solás, in Atlas (New York), April 1970. Adler, Renata, "Three Cuban Cultural Reports with Films Somewhere in Them," in A Year in the Dark , Berkeley, 1971. Matthews, M., in Films in Review (New York), May 1974. Biskind, P., " Lucia : Struggles with History," in Jump Cut (Chicago), July-August 1974. Blanco, Jorge Ayala, "Cine Cubano: Revaluaciones, Devaluaciones, y Presentaciones," in Movietone News (Seattle), November 1974. Taylor, A. M., in Film Quarterly (Berkeley), Winter 1974–75. Kovacs, Steven, " Lucia : Style and Meaning in Revolutionary Film," in Monthly Review (New York), June 1975. Luxemburg, Leonardo, "Latin American Films: Fourth Frontier," and "The Role of Film in Cuban Development" by Andres Hernandez, in Films of a Changing World: A Critical International Guide , edited by Jean Marie Ackerman, Washington, D.C., 1977. "Special Issue" of Jump Cut (Chicago), December 1978. King, J., interview with Humberto Solás, in Framework (Norwich), Spring 1979. Cine Cubano (Havana), no. 107, 1983. Lopez Morales, E., "Descubrimiento de Lucia, " in Cine Cubano (Habana), no. 124, 1988. Gonzalez, J.A., "Humberto Solás o la audacia de la emocion," in Cine Cubano (Habana), no. 128, 1990. Benamou, Catherine, "Cuban Cinema: On the Threshold of Gender," in Frontiers , vol. 15, no. 1, Winter 1994. Rose, P. W., "The Politics of the Trilogy Form: Lucia , the Oresteia and The Godfather ," in Film-Historia (Barcelona), vol. 5, no. 2/3, 1995. Braun, Rainer, "Kino in Kuba," in EPD Film (Frankfurt), vol. 14, no. 5, May 1997. Robert Phillip Kolker has called Humberto Solás's Lucia "something of an encyclopedia of progressive film in the sixties," and this invigoratingly feminist trilogy is indeed one of the greatest examples of stylistic virtuosity to emerge from any national cinema in recent years. 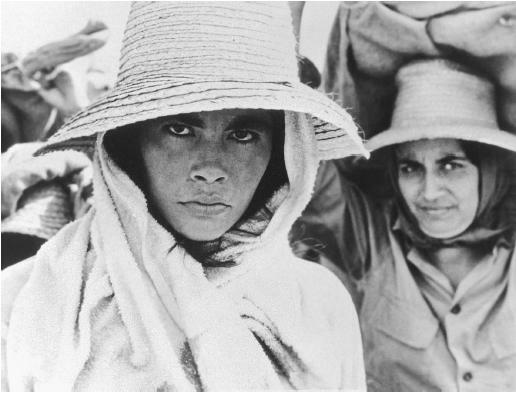 Solás's film depicts three women, all named Lucia, in their gradual acquisition of revolutionary consciousness, as they confront the specific historical dilemmas of their respective epochs—1895, 1932, and the post-revolutionary era of the 1960s. The film is remarkable in its ability to integrate diverse cinematic styles with an almost seamless fluidity. Lucia is a unique amalgam of Soviet style montage, hand-held shots in the manner of the early New Wave, and baroque stylization that recalls Antonioni and Bertolucci. The first episode (1895) is the most ambitious in its epic grandeur, although Solás's directoral restraint prevents his mise-en-scène from becoming hopelessly florid. This segment is superficially a revenge tragedy, although the emphasis on the suffering engendered by Spanish imperialism serves as tragic counterpoint to the central, doomed love affair. The frenetic shots of impoverished black soldiers on horseback remind the viewer of the travails of war at the very point that a Hollywood film would revert to a political escapism. After the inspired grandiosity of the 1895 segment, the second episode is conceived within the more modest requirements of Hollywood melodrama. Yet, paradoxically, this segment is perhaps the most subtly subversive of Solás's film. He has absorbed all of the mannerisms of melodramatic kitsch, but subverts them in order to make a political statement that transcends the common, soap-operaish woes of the isolated individual. The 1932 Lucia's romantic disillusion coincides with her disillusion with the regime that replaces that of the dictatorial Machado. Personal happiness and societal goals have become dialectically intertwined. Lucia 's last episode is understandably the most upbeat, although it is curiously the most dated of the trilogy. This exuberant study in "consciousness raising" takes place during the ambitious literacy campaign of the 1960s. This was the time when many Cuban women first grasped the ways in which sexism continued to contaminate their lives during the post-revolutionary period. Although the third episode of Lucia seems relatively minor when contrasted with the other two, its comic brio and good-natured didacticism make it enjoyable. Julianne Burton has remarked that "post-revolutionary Cuban cinema strives to unite cultural expression and political consciousness." Lucia is one of the most admirable results of his aspiration since Solás's narrative genius succeeds in explaining that much remarked-upon fusion of personal and political motivations during periods of revolutionary upheaval. Lucia was listed as one of the Top 100 Ibero-American Movies of all time by Noticine.com in 2008. If anyone wants to watch this movie, it is available in Youtube. Somebody spent time splinting the movie in segments and uploading it. Search for "Lucia film"